Q: How can I choose a solar power system for use? A:Your total electrical demand (or 'load') can be calculated by your installer. You will need to provide them with information such as the number of lights, appliances etc. 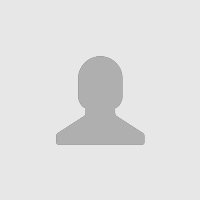 Then according to your requirement, we can calculate a suitable for you. Q: What type of solar power systems are there? A: There are two types of solar systems, off grid and on grid connect. On grid connect systems, often located in built up areas, supply solar electricity through an inverter directly to the household or the electricity grid if the system is providing more energy than the house needs. Off grid systems, also call standalone system, usually operate in remote areas, away from power supply lines or where supply can be unreliable. 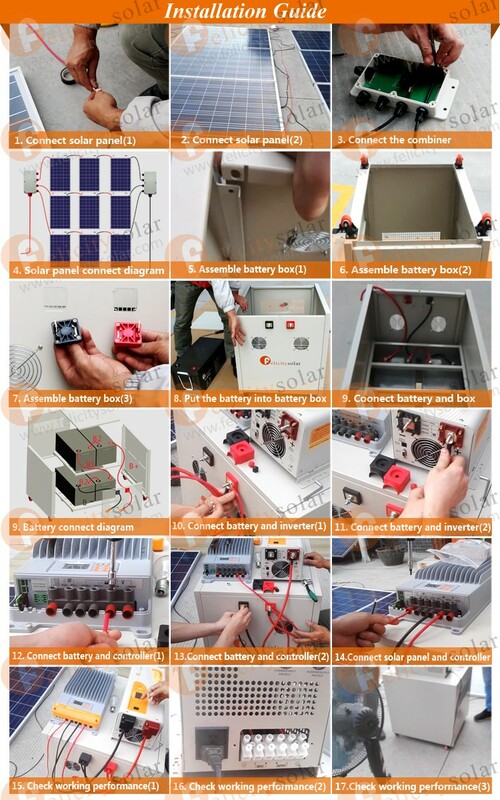 The electricity generated by the system is usually stored in a battery bank consisting of deep cycle batteries which are suited for repeated partial charge and discharge. Q: How can I install a solar power system by myself? 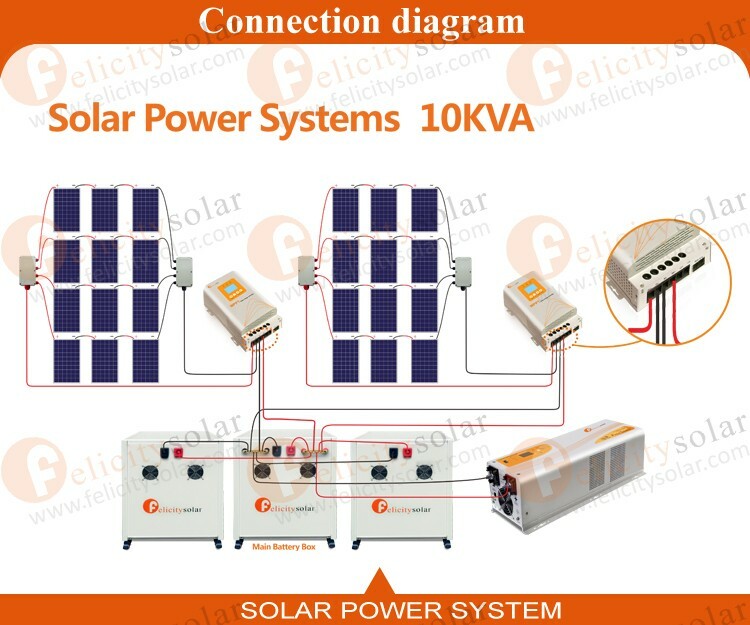 A: Felicitysolar solar power system is easy to install, we can provide the connection diagram for you. Q: What can affect the amount of solar energy received? A: The strength of the solar energy available depends on the time of year, the time of day, and the latitude of the generation point. The amount of energy generated can be further affected by the amount of dust and water vapour in the air, and the amount of cloud cover. Q: What kind of your battery? 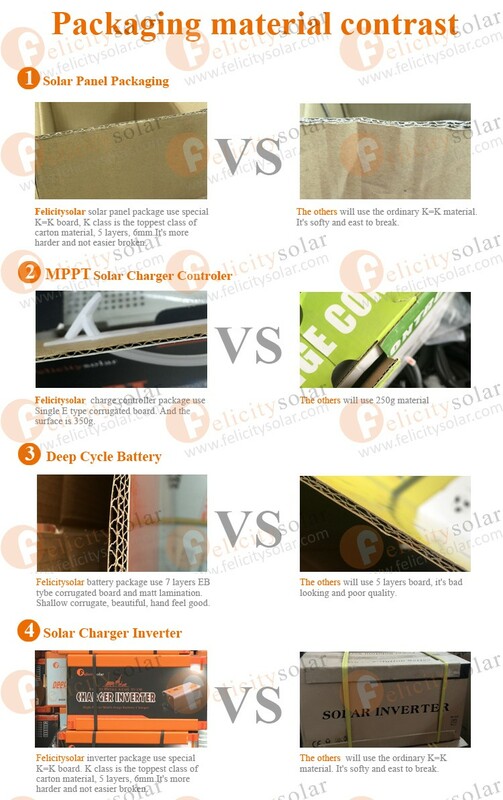 A: Felicitysolar battery is deep cycle free maintained GEL battery, better than lead acid battery. Q: What is the warranty for the solar power system? A: we offer 2 years warranty. A: T/T, L/C,western union, paypal, trade assurance or cash; 30% for deposit, the balance 70% before shipment. A: 3 work day with stock after receiving the payment. No stock, 20 work days after receiving the payment.